In nests? Not very often! All birds need to sleep — or at least snooze — sometime during each 24-hour period. And most sleep at night. 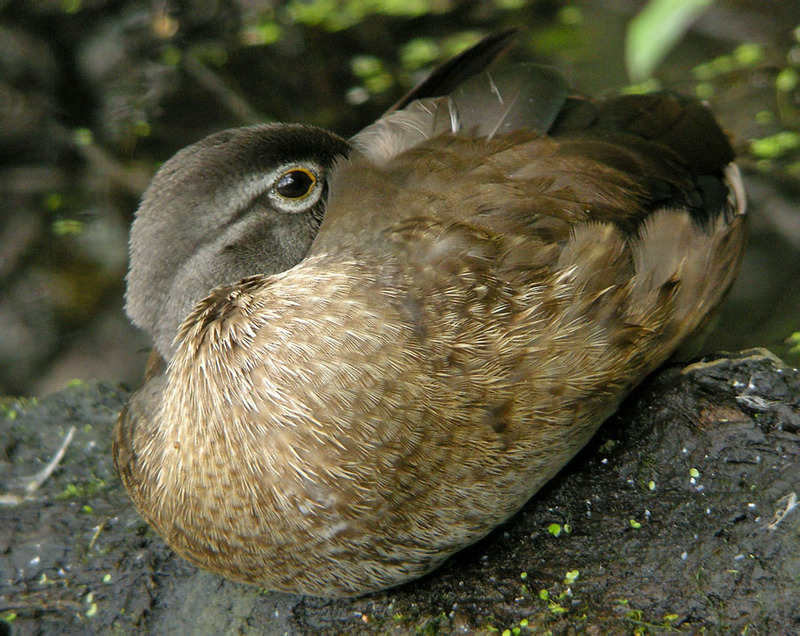 A bird (such as this Wood Duckling) may turn its head around and warm its beak under its shoulder-feathers. Songbirds find a protected perch, sheltered from rain and nighttime predators. Small forest birds often spend the night in tree cavities. Ducks sleep while floating in protected bays. Would you like to receive an email each week featuring the birds and stories of the week to follow? Sign up for BirdNote Weekly Preview here. Do you ever wonder where birds sleep? Let’s listen as the last bird-sounds of the day recede into nightfall. All birds need to sleep – or at least snooze – during each 24-hour period. Most sleep at night. Birds don’t usually sleep in nests, except to incubate eggs or brood young. They search out a place to roost, often selecting the same place night after night. Songbirds find a protected perch, sheltered from rain and safe from nighttime predators. Small forest birds often spend the night huddled together in tree cavities. Woodpeckers cling to vertical tree trunks. Starlings mass into huge flocks that blanket the trees. Seabirds select islands or cliffs on which to snuggle in for the night. Ducks sleep while floating in protected bays. Birds don't actually tuck their heads under their wings to sleep as we’ve been led to believe. But a bird may turn its head around and poke its beak under shoulder-feathers to keep it warm. It’s similar to the way we humans pull a quilt up to our nose during a cold winter’s night. Do you think birds dream? If so, what do you think birds dream about? Let us know on Facebook – search for BirdNote, all one word. I’m Mary McCann. Selection from Brahm’s lullaby “Cradle Song” played by The Budapest Strings, from the album Top 100 Pieces of Classical Music, 2010 Cobra Entainment. Songs and calls birds provided by The Macaulay Library of Natural Sounds at the Cornell Lab of Ornithology, Ithaca, New York. Swainson’s Thrush recorded by G.A. Keller. Ambient sounds provided by C. Peterson.